An example of the musical circles surrounding the French court of Louis XV at the time of the ravalement of the Franco-Flemish harpsichord in 1750. Anne-Jeanne Boucon, c.1752 (Art Institute of Chicago, USA) and her husband Jean-Joseph Cassanéa de Mondonville, c.1747 (Musée Antoine-Lécuyer, Saint Quentin, Aisne, France). Both works are pastels by Maurice Quentin de la Tour. The powerful personalities of the couple shine strongly from these stunning enlightenment portraits. Anne-Jeanne Boucon was part of many social and cultural circles during the period of the ravalement and decoration of the Franco-Flemish harpsichord. These included musicians, writers, and painters. 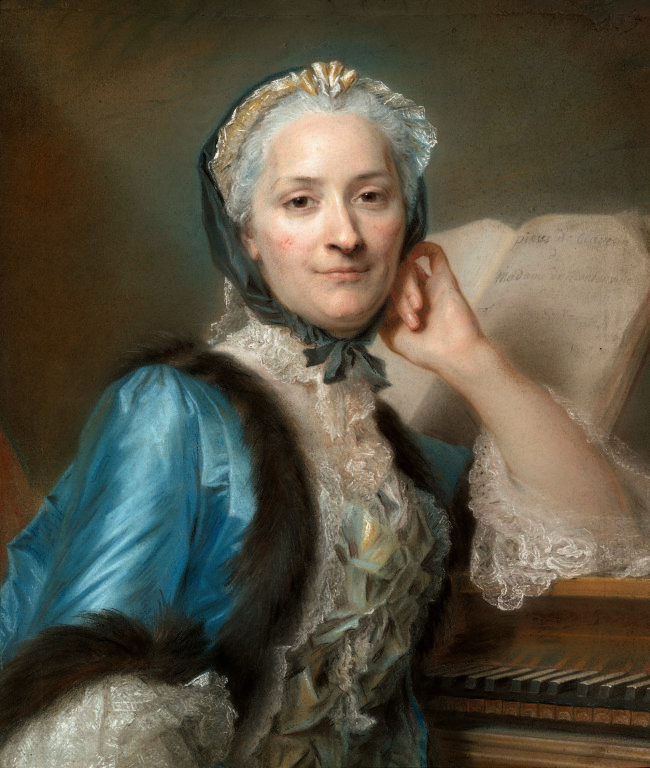 She was an excellent musician and composer and performed regularly on the harpsichord in informal house concerts of the French aristocracy and social elite. She was known particularly for her ability to read and play music at sight. She seems to have come by her musical talents by way of her parents who were both musical amateurs who owned a small house organ, a two-manual harpsichord by Blanchet and several important violins. All of these became her property after the death of her parents. notably by her teacher Jean-Philippe Rameau "La Boucon", in his famous Pieces de clavecin en concert, Paris, 1741. Such was the respect she enjoyed that she and her son were given an annuity of 600 livres by Louis XVI after the death in of her husband in 1772. By way of comparison the average rent for a two-bedroom apartment was 60 livres per annum, so that this was a very generous annuity. 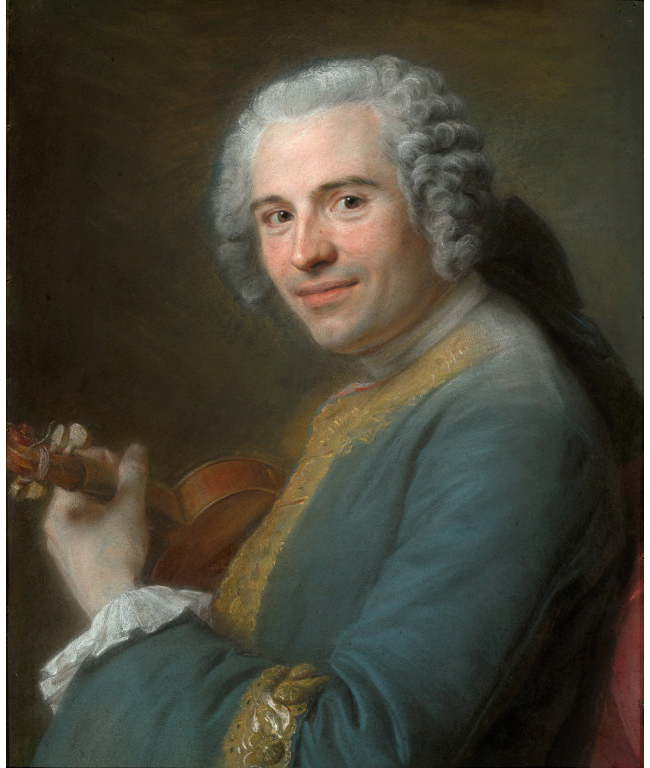 Jean-Joseph Cassanéa de Mondonville was a French violinist and composer and a younger contemporary of Jean-Philippe Rameau who gave lessons to de Mondonville's wife. Anne-Jeanne Boucon was already 39 in 1747 when she married Jean-Joseph who was 3 years her junior. The date of their marriage is just three years before the dated ravalement of the Franco-Flemish harpsichord when, possibly, work had already begun on its decoration and musical enlargement. A year after his marriage de Mondonville published his virtuosic Pièces de clavecin avec voix ou violon as a mark of respect to the talents and abilities of his new wife Anne-Jeanne Boucon. All indications are that their marriages was very happy throughout its duration. De Mondonville is known particularly as a composer of Grands motets, but also for his keyboard compositions. He championed the French style over le style italien which many felt was encroaching on and threatening the style of the French court. De Mondonville was therefore well treated by both Louis XV and by Madame de Pompadour. This was, naturally, reinforced by de Mondonville's wife's friendship with Mme. de Pompadour. De Mondonville became a violinist of the Chapelle royale and was appointed sous-maître in 1740 and then, in 1744 he was appointed as the chief administrator of the Royal Chapel. He produced operas and grands motets for the Opéra and the Concerts Spirituels respectively, and was associated with the Théatre des Petits-Cabinets, all the while carrying on with his career as a violinist. In 1755 he became director of the Concerts Spirituels on the death of Pancrace Royer. He died in Belleville near Paris at the age of sixty. The harpsichord which can be seen on the left in the pastel by de la Tour of Mme. de Mondonville is a clavecin ordinaire. At the time this meant that it was a smaller-compass, single-manual harpsichord, and not a grand ravalement double-manual 5-octave instrument. In fact, the compass cannot be seen, but it is clearly a single-manual instrument with the fashionable black ebony keyboard with bone-topped white sharps. But it is known that Mme. de Mondonville inherited a double-manual harpsichord by François-Étienne Blanchet I (c.1695 - 1761) who was the facteur des clavessins du roi. So why is she pictured in such an impressive and powerful enlightenment portrait with what was a mere clavecin ordinaire? The same question could be asked about the portrait of Mme de Pompadour in the portrait by François Boucher. In my view the answer lies in the extreme difficulty of making the two rows of keys in a painting of a double-manual harpsichord 'read' properly so that they show the distribution of the naturals and sharps correctly (which even so de la Tour has not done well - there seem to be 3 sharps followed by 3 sharps in the Boucon portrait) - and also so that the keys of the upper manual are correctly aligned with those of lower manual. Here it seems that the important thing for de la Tour (and for Boucher in the de Pompadour portrait) was to portray the importance and personality of the sitter, leaving the detail of an exact representation of the instrument as a secondary and much less important feature. Mme. 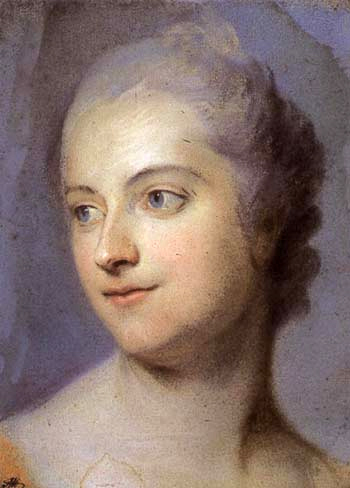 de Pompadour, Pastel by Maurice Quentin de la Tour, c.1747. Musée de la Louvre.